Exceptional Skin Care Products for Exceptional Skin! We do not believe there is one skin care line out there that is the BEST. We do however believe there are a lot of FABULOUS lines that specialize in different skin care conditions. We have selected for you the cream of the crop! Life Line Skin Care at The Pretty Hideaway! cells. These cells can proliferate and live almost indefinitely. And with this discovery, stem cell cures for incurable diseases -- like Parkinson's Disease, liver disease, and blindness -- now look promising. technology to create the highest quality, scientifically tested and most effective anti-aging products. Purchases of Lifeline Skin Care products help to fund further research into finding cures and treatments for: Diabetes, Parkinson's Disease, Blinding diseases of the eye, and liver disease. Hydropeptide Skin Care is now in Oviedo! At the Pretty Hideaway we search for products that are exceptional in delivering results and client satisfaction. Hydropeptide is a power-packed, award winning, anti-aging collection featured honored with over 30 beauty awards in the last few years and gaining a cult-like following. These awards include Best Cosmetics Brand of the Year, International Innovation Award, Defy-Your-Age-Beauty for "Best Day Cream with SPF" and "Best Skin Refresher". Hydropeptide takes the most advanced, scientifically proven skin care elements and simplifies the beauty routine, addressing a wide range of skin care concerns in just a few steps that feel like a luxurious spa experience. This collection currently includes over 30 different peptides that nourish, rejuvenate and visibly defy age, resulting in skin that looks better and acts younger. Hydropeptide is cruelty-free, paraben free and phthalate-free. The Pretty Hideaway loves Osmosis Skin Care! The Pretty Hideaway is proud to offer Osmosis skin care products in Oviedo, Florida. For decades most skincare companies have been using irritating ingredients that work by inflaming the skin. This has to change if we want to reverse aging skin. Most skincare companies also struggle to get adequate penetration (2-5% on average) and they have failed to address the lack of skin nutrition needed to feed the repair process. This has resulted in poor outcomes throughout the world. Osmosis achieves remarkable results by addressing every aspect of skin damage; collagen/elastin production, scar tissue build-up, loss of skin nutrition and growth factors, and DNA damage. In addition, Osmosis Skincare avoids ingredients and strategies that weaken and inflame the skin. Finally, Osmosis Skincare differentiates itself by using the most advanced ingredients in the world. They are the first to offer DNA repair strategies using Zinc Finger Technology™. They are the first to offer liposomally delivered stem cell growth factors. They have over 17 patents pending for ingredients that have the unique ability to improve the skin without damaging or interfering with its proper function. ****Please not that Osmosis is NOT sold on Amazon and other online retailers. Please click on this link to find out important information on counterfeit products and where NOT to buy Osmosis: http://www.osmosisskincare.com/AuthorizedDealers. 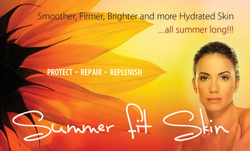 Skin Fitness Skin Care is Organic Skin Care at it's Best! The Secret to healthy beautiful skin is really no secret at all...it's simple...Pure and Simple Workout. Skin Fitness Therapy combines the best of natural ingredients with scientifically based formulas. The ingredients are carefully selected and formulated to target both the epidermis and skin receptors at the cellular level stimulating it's natural ability to crave nutrients. The advanced selection of vitamins, fruit pulps, enzymes and acid corrective skin solution components are very effective when it comes to reshaping the skin. The products use natural colorings instead of synthetics, and they are paraben free. They use nanotechnology, are green friendly, and use natural and organic ingredients with no harsh chemicals. All products are concentrated solutions requiring a small amount of product to be used. Skin Fitness won LNE and Spa's BEST 2012 award for their green product "Pure Oxygen Serum"
Skin Script RX Skin Care is so Yummy! Offering Retail Products and Services Skin Script RX Skin Care is a natural, yet clinical skin care designed for anti-aging, hyperpigmentation, melasma, sun-damage, teen and adult acne, and rosacea. Antioxidants, exfoliants, and natural brighteners are the base of this skin care line to achieve remarkable results. Skin Script is dedicated to beautiful, healthy skin using fresh thinking to deliver the latest in vitalized, youthful looking skin. Skin Script provides a clinical, professional skin care line containing retinols, glycolics, lactics, salicylics and natural The natural fruit enzymes and peels are formulated with higher levels of the natural lighteners, kojic and arbutin. Skin Script is also sold at a reasonable price point with most products available for under $30.00. And did I mention it smells delicious?